My latest article on PopMatters is now up: Jumping Disappointment in LittleBigPlanet 2. Jumping in LittleBigPlanet 2 aside (which I'm actually alright with), the game is pretty amazing. Media Molecule's levels improve on their contributions to the first game. They still feel aesthetically unified and absolutely charming. They also fit into slightly adorable narrative and flow into each other quite well, sometimes literally through the use of level-joining portals, easing the transition between locations. The real highlights are, of course, the sheer number of game types featured. 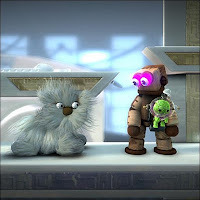 The versus levels in particular show off what LBP 2 can do with its vast amount of features and contraptions - everything from side-scrolling space shooters to billiards. While I understand the concern that LBP 2 merely repackaged old genres, recreating sub-par versions of better games, I think it is overstated. Yes, there are a lot of crappy renditions of genre staples, which are pleasing for a brief moment before nostalgia and awe at their constructions start to fade. However, I think of these experiences, particular those created by Media Molecule, as proofs of concept. They show off a few neat aspects of the game and may potentially inspire others to create far more stunning LBP works of art. Unfortunately, accessing the best user created levels takes some patience. Many of the great features in LBP 2, particularly the gravity changing features David Smith mentioned in his interview, have not be explored much at all. I played the first LBP a few months before the sequel launched and there are some fantastic user levels. Just imagine how great LBP 2 user created levels can be in two years time. Like the first, the game just gets better with age. Yeah I have to agree though LBP2 does nothing better than anyone genre the fact that you have access to create your own content is just amazing. The game has to age like a fine wine it takes time to cultivate a great level.